Find two students who want to joust! 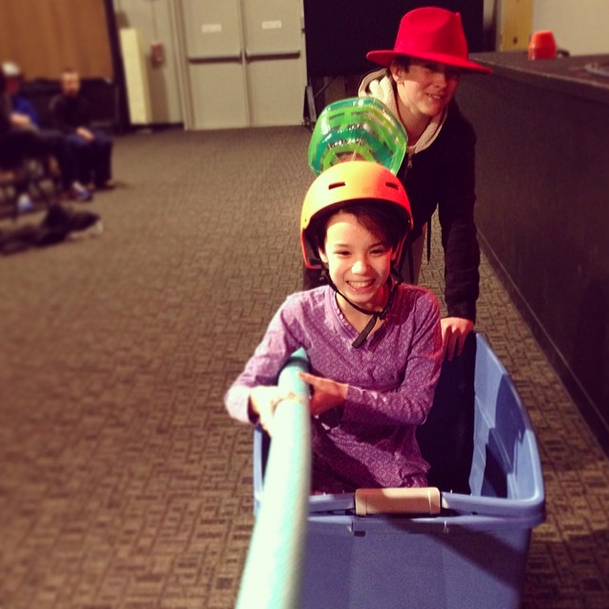 Line them up across from each other each with a ballon velcroed their helmet/hat, armed with a foam pool noodle, and sitting in a storage tub on wheels with a friend willing to push them. Then they both come at each other like dueling knights. Whoever can knock the balloon off the other jouster’s head first wins! 1. Foam Pool Noodles. You can find these at Walmart or even the dollar store cheap. 4. Balloons. Don’t get really small ones or else it will be really hard to joust them off. 5. Helmets or Hats. Whatever you have laying around will do. 6. Adhesive Velcro. You can buy it at Walmart, don’t get “Industrial” strength for this game, we don’t want it to be too strong. You’ll also need to prepare the Hats/Helmets and Balloons. Just use velcro to attach them. It’s a tricky balance – you want them not to fall off too easily, but you want them to come off when hit with a pool noodle. So do some testing. 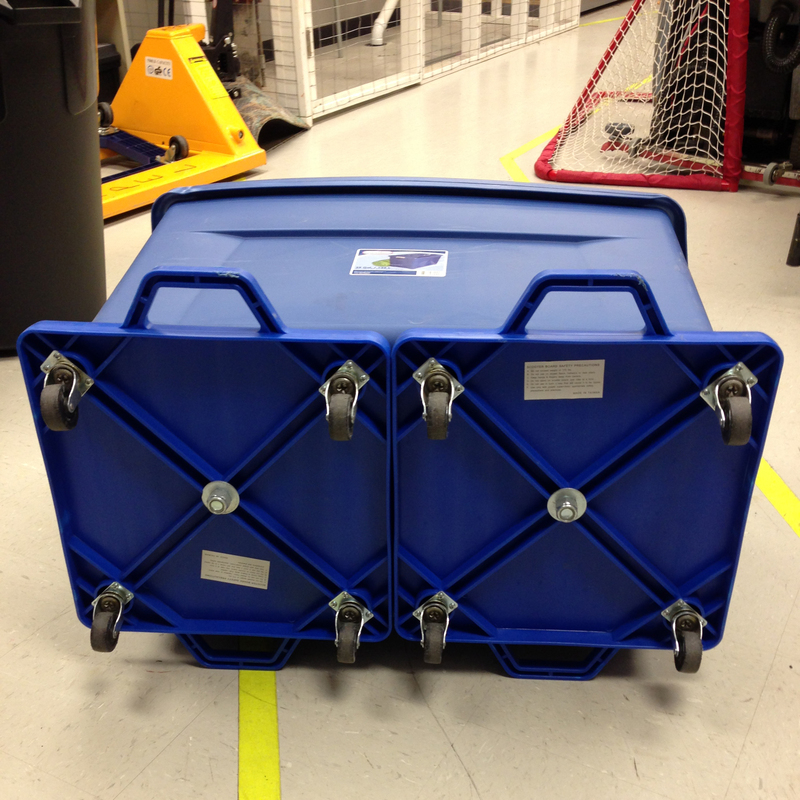 Special Bonus: Now you have storage tubs with wheels! We actually love these for storage purposes! 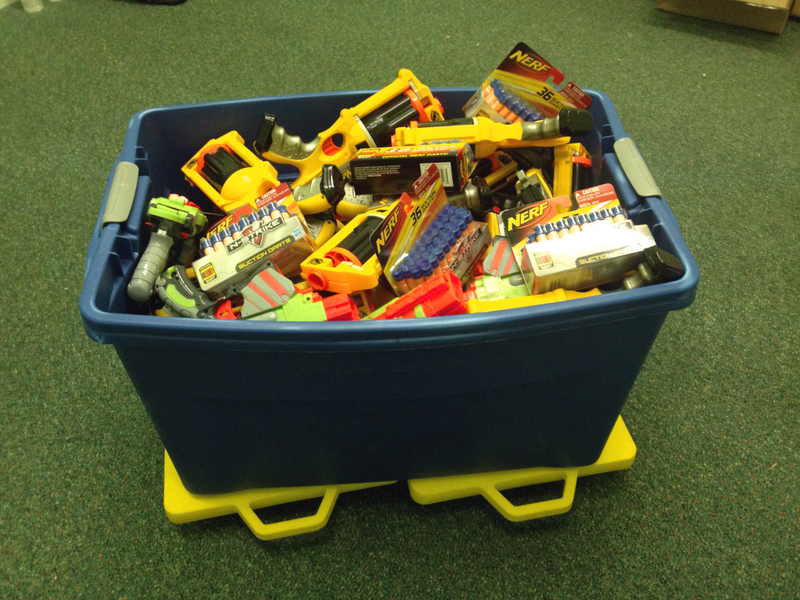 We keep our Nerf Gun arsenal in them and wheel them out for battles every once in a while. For this game you’ll need a nice long area so you can “joust” properly. Each jousting team needs two people – one for pushing and one for jousting. One student needs to be sitting in the tub wearing the head gear with the balloon attached and wielding the mighty pool noodle. The other student stands behind him/her ready to push. On your count, the jousters race towards once another from opposite sides of the room. Both of them swinging for the balloons on the other person’s head. The first person who’s balloon falls off loses. We were already planning to do a game very similar to this this weekend. We are using office chairs, pool noodles, and a points system! Great idea! 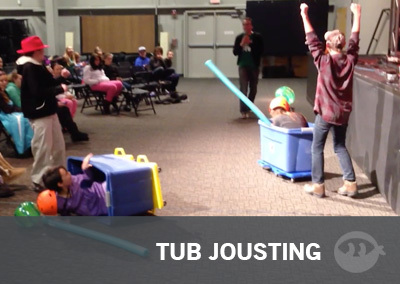 But at $110 per jousting tub contraption ($220 total!!!) it’s kinda out of reach for a game. Would love more ideas where it doesn’t cost a ton of $ to use. I’ll try to see how to do this on a budget. Thanks for the great ideas and keep it up! Thanks for the comment, I appreciate it! You’re def right, these tubs are an investment upfront, but you could get away with a cheaper version like Jason mentioned in another comment about using office chairs. But if you have storage tubs hanging around already, you could probably find scooters cheap on eBay, and whip something together that could be used for a lot of different games. Our kids love the tubs in wheels and we use them for games a lot, it could be a worthwhile investment. Not to mention now you have storage on wheels! But yeah I get it, we usually try to post games that could be played on a really tight budget. Thanks for the feedback! Also, like mentioned above furniture dollies are cheaper options. We made these with 1 furniture dolly and 2 totes (for strength) at $20/dolly and $17/tote (plus some bolts). Works great! I am thinking thick plywood and some wheels from the hardware store will cut the cost in half. Thanks for the game idea. You could rock an automotive creeper (only time a creeper is allowed at youth group) and just push them on it. You could borrow some from parents with some in the garage or pick them up for $30 at a hardware store! I can usually find tubs like that at thrift stores. Maybe they might have something to use for the wheels as well! Great idea! I might just play this with my husband and tell the youth they can push! This looks like so much fun! I’m going to pick up 2 furniture dolly’s at Home Depot this week and give it a try. I’m stoked, looks fun!